This article is about the superhero team. For other uses, see X-Men (disambiguation). The X-Men are a team of fictional superheroes appearing in American comic books published by Marvel Comics. Created by artist/co-writer Jack Kirby and writer Stan Lee, the characters first appeared in The X-Men #1 (September 1963). They are among the most recognizable and successful intellectual properties of Marvel Comics, appearing in numerous books, television shows, films, and video games. Most of the X-Men are mutants, a subspecies of humans who are born with superhuman abilities activated by the "X-Gene". The X-Men fight for peace and equality between normal humans and mutants in a world where antimutant bigotry is fierce and widespread. They are led by Charles Xavier, also known as Professor X, a powerful mutant telepath who can control and read minds. Their archenemy is Magneto, a powerful mutant with the ability to manipulate and control magnetic fields and is the leader of the Brotherhood of Mutants. Both have opposing views and philosophies regarding the relationship between mutants and humans. While the former works towards peace and understanding between mutants and humans, the latter views humans as a threat and believes in taking an aggressive approach against them, though he has found himself working alongside the X-Men from time to time. Professor X is the founder of Xavier's School for Gifted Youngsters at a location commonly called the X-Mansion, which recruits mutants from around the world. Located in Salem Center in Westchester County, New York, the X-Mansion is the home and training site of the X-Men. 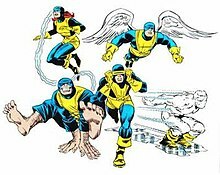 The founding five members of the X-Men who appear in The X-Men #1 (September 1963) are Angel (Archangel), Beast, Cyclops, Iceman, and Marvel Girl (Jean Grey); Professor X and Magneto also made their first appearances in The X-Men #1. Since then, dozens of mutants from various countries and diverse backgrounds, and even a number of non-mutants, have held membership as X-Men. In 1963, with the success of Spider-Man in Amazing Fantasy, as well as the Hulk, Thor, Iron Man, and the Fantastic Four, co-creator Stan Lee wanted to create another group of superheroes but did not want to have to explain how they got their powers. In 2004, Lee recalled, "I couldn't have everybody bitten by a radioactive spider or exposed to a gamma ray explosion. And I took the cowardly way out. I said to myself, 'Why don't I just say they're mutants. They were born that way.'" The X-Men, I did the natural thing there. What would you do with mutants who were just plain boys and girls and certainly not dangerous? You school them. You develop their skills. So I gave them a teacher, Professor X. Of course, it was the natural thing to do, instead of disorienting or alienating people who were different from us, I made the X-Men part of the human race, which they were. Possibly, radiation, if it is beneficial, may create mutants that'll save us instead of doing us harm. I felt that if we train the mutants our way, they'll help us – and not only help us, but achieve a measure of growth in their own sense. And so, we could all live together. Lee devised the series title after Marvel publisher Martin Goodman turned down the initial name, "The Mutants," stating that readers would not know what a "mutant" was. Within the Marvel Universe, the X-Men are widely regarded to have been named after Professor Xavier himself. The original explanation for the name, as provided by Xavier in The X-Men #1 (1963), is that mutants "possess an extra power ... one which ordinary humans do not!! That is why I call my students ... X-Men, for EX-tra power!" 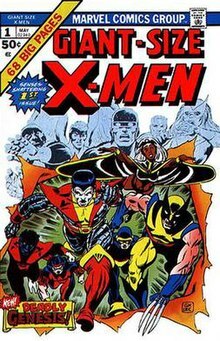 Early X-Men issues introduced the original team composed of Cyclops, Marvel Girl, Beast, Angel, and Iceman, along with their archenemy Magneto and his Brotherhood of Evil Mutants featuring Mastermind, Quicksilver, Scarlet Witch, and Toad. The comic focused on a common human theme of good versus evil and later included storylines and themes about prejudice and racism, all of which have persisted throughout the series in one form or another. The evil side in the fight was shown in human form and under some sympathetic beginnings via Magneto, a character who was later revealed to have survived Nazi concentration camps only to pursue a hatred for normal humanity. His key followers, Quicksilver and the Scarlet Witch, were Romani. Only one new member of the X-Men was added, Mimic/Calvin Rankin, but soon left due to his temporary loss of power. The title lagged in sales behind Marvel's other comic franchises. In 1969, writer Roy Thomas and illustrator Neal Adams rejuvenated the comic book and gave regular roles to two recently introduced characters: Havok/Alex Summers (who had been introduced by Roy Thomas before Adams began work on the comic) and Lorna Dane, later called Polaris (created by Arnold Drake and Jim Steranko). However, these later X-Men issues failed to attract sales and Marvel stopped producing new stories with issue #66, later reprinting a number of the older comics as issues #67–93. In Giant-Size X-Men #1 (1975), writer Len Wein and artist Dave Cockrum introduced a new team that starred in a revival of The X-Men, beginning with issue #94. This new team replaced the previous members with the exception of Cyclops, who remained. This team differed greatly from the original. Unlike in the early issues of the original series, the new team was not made up of teenagers and they also had a more diverse background. Each was from a different country with varying cultural and philosophical beliefs, and all were already well-versed in using their mutant powers, several being experienced in combat. The "all-new, all-different X-Men" were led by Cyclops, from the original team, and consisted of the newly created Colossus (from the Soviet Union), Nightcrawler (from West Germany), Storm (from Kenya), and Thunderbird (a Native American of Apache descent), and three previously introduced characters: Banshee (from Ireland), Sunfire (from Japan), and Wolverine (from Canada). Wolverine eventually became the breakout character on the team and, in terms of comic sales and appearances, the most popular X-Men character. However, this team would not remain whole for long as Sunfire quit immediately and never really accepted the other members, and Thunderbird would die in the very next mission. Filling in the vacancy, a revamped Jean Grey soon rejoined the X-Men under her new persona of "Phoenix". Angel, Beast, Iceman, Havok, and Polaris also made significant guest appearances. The revived series was illustrated by Cockrum, and later by John Byrne, and written by Chris Claremont. Claremont became the series' longest-running contributor. The run met with critical acclaim and produced such landmark storylines as the death of Thunderbird, the emergence of Phoenix, the saga of the Starjammers and the M'Kraan Crystal, the introduction of Alpha Flight and the Proteus saga. Other characters introduced during this time include Amanda Sefton, Mystique, and Moira MacTaggert, with her genetic research facility on Muir Island. The 1980s began with the comic's best-known story arc, the Dark Phoenix Saga, which saw Phoenix manipulated by the illusionist Mastermind and becoming corrupted with an overwhelming lust for power and destruction as the evil Dark Phoenix. Other important storylines included Days of Future Past, the saga of Deathbird and the Brood, the discovery of the Morlocks, the invasion of the Dire Wraiths and The Trial of Magneto, as well as X-Men: God Loves, Man Kills, the partial inspiration for the 2003 movie X2: X-Men United. By the early 1980s, X-Men was Marvel's top-selling comic title. Its sales were such that distributors and retailers began using an "X-Men index", rating each comic book publication by how many orders it garnered compared to that month's issue of X-Men. The growing popularity of Uncanny X-Men and the rise of comic book specialty stores led to the introduction of a number of ongoing spin-off series nicknamed "X-Books." The first of these was The New Mutants, soon followed by Alpha Flight, X-Factor, Excalibur, and a solo Wolverine title. When Claremont conceived a story arc, the Mutant Massacre, which was too long to run in the monthly X-Men, editor Louise Simonson decided to have it overlap into several X-Books. The story was a major financial success, and when the later Fall of the Mutants was similarly successful, the marketing department declared that the X-Men lineup would hold such crossovers annually. Throughout the decade, Uncanny X-Men was written solely by Chris Claremont, and illustrated for long runs by John Byrne, Dave Cockrum, Paul Smith, John Romita, Jr., and Marc Silvestri. Additions to the X-Men during this time were Kitty Pryde/Shadowcat, Dazzler, Forge, Longshot, Psylocke, Rogue, Rachel Summers/Phoenix, and Jubilee. In a controversial move, Professor X relocated to outer space to be with Lilandra Neramani, Majestrix of the Shi'ar Empire, in 1986. Magneto then joined the X-Men in Xavier's place and became the director of the New Mutants. This period also included the emergence of the Hellfire Club, the arrival of the mysterious Madelyne Pryor, and the villains Apocalypse, Mister Sinister, Mojo, and Sabretooth. In 1991, Marvel revised the entire lineup of X-Men comic book titles, centered on the launch of a second X-Men series, simply titled X-Men. With the return of Xavier and the original X-Men to the team, the roster was split into two strike forces: Cyclops's "Blue Team" (chronicled in X-Men) and Storm's "Gold Team" (in The Uncanny X-Men). Its first issues were written by longstanding X-Men writer Chris Claremont and drawn and co-plotted by Jim Lee. Retailers pre-ordered over 8.1 million copies of issue #1, generating and selling nearly $7 million (though retailers probably sold closer to 3 million copies), making it, according to Guinness Book of World Records, the best-selling comic book of all-time. Guinness presented honors to Claremont at the 2010 San Diego Comic-Con. Another new X-book released at the time was X-Force, featuring the characters from The New Mutants, led by Cable; it was written by Rob Liefeld and Fabian Nicieza. Internal friction soon split the X-books' creative teams. In a controversial move, X-Men editor Bob Harras sided with Lee (and Uncanny X-Men artist Whilce Portacio) over Claremont in a dispute over plotting. Claremont left after only three issues of X-Men, ending his 16-year run as X-Men writer. Marvel replaced Claremont briefly with John Byrne, who scripted both books for a few issues. Byrne was then replaced by Nicieza and Scott Lobdell, who would take over the majority of writing duties for the X-Men until Lee's own departure months later when he and several other popular artists (including former X-title artists Liefeld, Portacio, and Marc Silvestri) would leave Marvel to form Image Comics. Jim Lee's X-Men designs would be the basis for much of the X-Men animated series and action figure line as well as several Capcom video games. The 1990s saw an even greater number of X-books with numerous ongoing series and miniseries running concurrently. X-book crossovers continued to run annually, with "The X-Tinction Agenda" in 1990, "The Muir Island Saga" in 1991, "X-Cutioner's Song" in 1992, "Fatal Attractions" in 1993, "Phalanx Covenant" in 1994, "Legion Quest"/"Age of Apocalypse" in 1995, "Onslaught" in 1996, and "Operation: Zero Tolerance" in 1997. Though the frequent crossovers were criticized by fans as well as editorial and creative staff for being artificially regular, disruptive to the direction of the individual series, and having far less lasting impact than promised, they continued to be financially successful. There were many new popular additions to the X-Men in the 1990s, including Gambit, Cable, and Bishop. Gambit became one of the most popular X-Men, rivaling even Wolverine in size of fanbase after his debut in Uncanny X-Men #266 (Aug. 1990). Many of the later additions to the team came and went, such as Joseph, Maggott, Marrow, Cecilia Reyes, and a new Thunderbird. 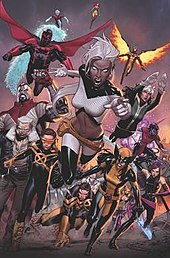 Xavier's New Mutants grew up and became X-Force, and the next generation of students began with Generation X, featuring Jubilee and other teenage mutants led and schooled by Banshee and ex-villainess Emma Frost at her Massachusetts Academy. In 1998, Excalibur and X-Factor ended and the latter was replaced with Mutant X, starring Havok stranded in a parallel universe. Marvel launched a number of solo series, including Deadpool, Cable, Bishop, X-Man, and Gambit, but few of the series would survive the decade. In 2000, Claremont returned to Marvel and was put back on the primary X-Men titles during the Revolution revamp. He was later removed from the two flagship titles in 2001 and created his spin-off series, X-Treme X-Men. X-Men had its title changed to New X-Men and writer Grant Morrison took over. The book is often referred to as the Morrison-era, due to the drastic changes he made, beginning with "E Is For Extinction," where a new villain, Cassandra Nova, destroys Genosha, killing sixteen million mutants. Morrison also brought reformed ex-villain Emma Frost into the primary X-Men team, and opened the doors of the school by having Xavier "out" himself to the public about being a mutant. The bright spandex costumes that had become iconic over the previous decades were replaced by black leather street clothes reminiscent of the uniforms of the X-Men films. Morrison also introduced Xorn, who would figure prominently in the climax of his run. Ultimate X-Men set in Marvel's revised imprint was also launched, while Chuck Austen began his controversial run on Uncanny X-Men. Several short-lived spin-offs and miniseries started featuring several X-Men in solo series, such as Emma Frost, Gambit, Mystique, Nightcrawler, and Rogue. Another series, Exiles, started at the same time and concluded in December 2007 which led to New Exiles in January 2008 written by Claremont. Cable and Deadpool's books were merged into one book, Cable & Deadpool. Following Morrison's departure, a third core X-Men title, Astonishing X-Men was launched which was written by Joss Whedon. New X-Men: Academy X was also launched focusing on the lives of the new young mutants at the Institute. This period included the resurrections of Colossus and Psylocke, a new death for Jean Grey, who later returned temporarily in the X-Men: Phoenix - Endsong, as well as Emma Frost becoming the new headmistress of the Institute. The Institute, formerly ran as a school (until the depowering of 98% of the mutant population), served as a safe haven to mutants who are still powered. In 2007, the "Messiah Complex" storyline saw the destruction of the Xavier Institute and the disbanding of the X-Men. It spun the new volumes of X-Force, following the team led by Wolverine, and Cable, following Cable's attempts at protecting Hope Summers. X-Men was renamed into X-Men: Legacy which focused on Professor X, Rogue and Gambit. Under Cyclops's leadership, the X-Men later reformed in Uncanny X-Men #500, with their new base located in San Francisco. Uncanny X-Men returned to its roots as the flagship title for the X-Franchise and served as the umbrella under which the various X-Books co-exist. In 2009, Messiah War written by Craig Kyle and Chris Yost served as the second part in the trilogy (that began with Messiah Complex) was released. Utopia written by Matt Fraction, was a crossover of Dark Avengers and Uncanny X-Men that served as a part of the "Dark Reign" storyline. A new New Mutants volume written by Zeb Wells, which featured the more prominent members of the original team reunited, was launched. Magneto joined the X-Men during the Nation X storyline to the dismay of other members of the X-Men, such as Beast, who left the team. Magneto began to work with Namor to transform Utopia into a homeland for both mutants and Atlanteans. After the conclusion of Utopia, Rogue became the main character of X-Men: Legacy. Notable additions to the X-Men have been Emma Frost, Husk, Northstar, Armor, Pixie and Warpath, while former villains such as Juggernaut, Lady Mastermind, Mystique, and Sabretooth became members of the X-Men. Other notable story arcs of this decade are "E Is For Extinction" (2001), "Planet X," "Here Comes Tomorrow," "Gifted" (2004), "House of M" (2005), Deadly Genesis (2005–2006), "Endangered Species" (2007), "Divided We Stand" (2008), "Manifest Destiny" (2008–2009), X-Infernus, and "Necrosha" (2009). The X-Men were also involved in the "Secret Invasion" storyline. In 2010, "Second Coming" continued the plot threads on Messiah Complex and House of M, and in 2012 "Avengers vs. X-Men" served as a closure to those story lines. It featured the death of Professor X and reappearance of new mutants. In 2011, the aftermath of the "X-Men: Schism" led to the fallout between Wolverine and Cyclops. Featured in a new series titled Wolverine and the X-Men, Wolverine rebuilt the original X-Mansion and named it the Jean Grey School for Higher Learning. In 2012, as part of the Marvel NOW! relaunch, several X-Men titles were canceled and relaunched, including X-Force, X-Factor, X-Men: Legacy, X-Men and Uncanny X-Men. The relaunched Uncanny X-Men featured Cyclops, his team and the new mutants, taking up residency in the Weapon X facility, which they have rebuilt into a school — the New Charles Xavier School for Mutants. New flagship titles such as Amazing X-Men and All-New X-Men were launched. The latter featured the original five X-Men members who were brought to the present day. In 2013, for the 50th anniversary of the X-Men, "Battle of the Atom" was published which involved members of both X-Men schools trying to decide what to do about the time-displaced original X-Men. In 2014, Wolverine was killed off in the "Death of Wolverine" story arc. In 2015, as part of "All-New, All-Different Marvel", three team books were launched: the second volume of All-New X-Men, the fourth volume of Uncanny X-Men and Extraordinary X-Men. X-23 took on the mantle of Wolverine and got a new solo series and Old Man Logan also received a new ongoing series. During this period, the mutants dealt with the threat of the Terrigen cloud that circulated the world and appeared to be toxic to them, placing the X-Men at odds with the Inhumans. The X-Men also dealt with Apocalypse resurfacing, and the truth of what happened between Cyclops and the Inhumans that led to his death. Storm's team resided in Limbo and worked to bring mutants to safety away from the Terrigen. Magneto's team took on a more militant approach. Beast worked alongside the Inhumans to attempt to find a way to alter the state of the Terrigen, but later discovered that it couldn't be altered and would have rendered Earth toxic for mutants. This revelation caused the X-Men to declare war against the Inhumans. In 2017, the ResurrXion lineup was launched with X-Men: Prime. It introduced new titles; X-Men Blue, X-Men Gold, Weapon X, new volumes of Astonishing X-Men and Generation X and new solo series for Cable, Jean Grey, and Iceman. With the Terrigen gone, the X-Men vacated Limbo and moved to Central Park where they returned to their heroic roots instead of constantly living in fear for their survival. Other notable changes include Kitty Pryde as the new leader of the X-Men, the time-displaced X-Men working with Magneto, Old Man Logan turning Weapon X into a black ops team, and mutant characters crossing over from Earth-1610 to the Earth-616 universe. Early 2018 saw the Phoenix Force returning to earth and mysteriously resurrecting the original Jean Grey. A new series featuring the original Jean leading a team of X-Men called X-Men Red was released later that same month. Rogue and Gambit's relationship became a focal point during the Rogue & Gambit miniseries and again in the Till Death Do Us Part story arc in X-Men Gold, which saw the two finally tie the knot, and once more during the Mr. & Mrs. X miniseries, which saw the new couple attempt to take their honeymoon but end up involved in an intergalactic conspiracy. Other noteworthy plot points included Wolverine's return coinciding with the arrival of a mysterious new villain named Persephone, Psylocke's return to her original body, Magneto's steady return to villainy, and the time-displaced X-Men facing the consequences of their presence in the 616 timeline, and the return of Cyclops. 2019 saw a new volume of Uncanny X-Men released beginning with a 10-part weekly story arc. Notable additions to the X-Men have been X-23, Hope Summers, M, and Honey Badger. Other notable story arcs of this decade are "Curse of the Mutants" (2010-2011), "Age of X", "Regenesis" (2011), "AXIS" (2014), "The Black Vortex" (2015), "Death of X" (2016), "Inhumans vs. X-Men" (2016-2017), Phoenix Resurrection (2017-2018), and "X-Men: Disassembled" (2019). The X-Men use many recurring plot-devices and motifs for their various story arcs over the years that have become commonplace within the X-Men canon. Many of the X-Men's stories delve into time travel either in the sense of the team traveling through time on a mission, villains traveling through time to alter history, or certain characters traveling from the past or future in order to join the present team. Story arcs and spin-offs that are notable for using this plot device include Days of Future Past, Messiah Complex, All-New X-Men, Messiah War, and Battle of the Atom. Characters who are related to time travel include: Apocalypse, Bishop, Cable, Old Man Logan, Prestige, Hope Summers, Tempus, and Stryfe. Many of the characters deal with the topic of fate. In particular, Destiny's abilities of precognition have affected certain plot points in the X-Men's history long after she was killed off due to both the X-Men and their enemies constantly searching for her missing diaries that foretell certain futures. The topic of fate takes center stage yet again in a story arc called "The Extremists" involving attacks against the Morlocks due to one of them seeing a dark future for their people. Some characters believe they already know their own fates, such as Apocalypse believing he is fated to rule the mutants or Magneto believing he is fated to lead the mutants to rise up against humans. Other characters such as Jean, Prestige, Evan Sabanur, Hope Summers, and Warren Worthington III have all been wary of their fates and have all taken measures to alter their futures. Space travel has been a common staple in the X-Men books beginning with the Phoenix and Dark Phoenix sagas. Since then space has been involved in many stories involving the X-Men's allies and occasional rivals the Shi'ar along with stories involving the Phoenix Force. Space has been the setting for many stories involving the likes of The Brood, such as the story arc where the villainous species was first introduced. Through space noteworthy characters like The Starjammers and Vulcan were introduced. Space Travel played a major role in Joss Whedon's run on Astonishing X-Men via the introduction of S.W.O R.D. and especially in one of the final story arcs under his authorship called "Unstoppable". Other notable story arcs involving space included "X-Men: The End," "Rise and Fall of the Shi'ar Empire," "X-Men: Kingbreaker," "War of Kings," and "The Black Vortex." The topic of sanity has been addressed in many of the major heroes and villains of X-Men. Most famously this is addressed in Jean Grey when she gains near omnipotence through the Phoenix and Professor Xavier after he violently uses his powers against Magneto, unintentionally creating Onslaught. Mystique's sanity wavers throughout the franchise as her constant transformations causes more and more of her mind to fracture. Ever since swapping bodies with Revanche, Psylocke has occasionally struggled to maintain her sanity due to her more aggressive nature and new powers. The character Deadpool is famous for his blatant lack of sanity. After Magneto stripped Wolverine of his metal bones, Wolverine began to become increasingly feral throughout most of the mid to late 1990s X-Men comics. The nature of Rogue's powers affecting her sanity due to her retaining the memories of others has been a central plot device on many occasions, most famously retaining Ms. Marvel's psyche throughout most of the 1980s. Most recently Emma Frost's sanity has become fractured ever since Cyclops died in her arms, causing her to declare war against Inhumans. Other characters who have had issues with sanity include Cyclops, Sabretooth, Magik, Quentin Quire, X-23, and Prestige. In the Marvel Universe, mutant rights is one of the hot controversial political topics and is something that is addressed numerous times in the X-books as a plot device. While some politicians like Valerie Cooper have legitimately tried to help the X-Men, most have made it their mission to discredit the X-Men in order to eliminate mutants once and for all. Senator Robert Kelly began his platform on a strong outspoken anti-mutant sentiment until he changed his mind after being rescued by mutants later on in his career. When Sabretooth's human son Graydon Creed ran for office, the X-Men sent in Cannonball and Iceman to discreetly join his campaign team and find anything on his anti-mutant agenda. This continued until it boiled to a head when his assassination led to "Operation: Zero Tolerance." Some of the issues presented in the comics serve as allegory to modern issues in the real world, such as Lydia Nance suggesting mass mutant deportation. The X-Men exist in the Marvel Universe along with other characters featured in Marvel Comics series. They often meet characters from other series, and the global nature of the mutant concept means the scale of stories can be highly varied. The X-Men's enemies range from mutant thieves to galactic threats. Historically, the X-Men have been based in the Xavier Institute, in the town of Salem, located in Westchester County, New York, and are often portrayed as a family. The X-Mansion is often depicted with three floors and two underground levels. To the outside world, it acted as a higher learning institute until the 2000s, when Xavier was publicly exposed as a mutant at which point it became a known mutant boarding school. Xavier funds a corporation aimed at reaching mutants worldwide, though it ceased to exist following the 2005 "Decimation" storyline. The X-Men benefit from advanced technology such as Xavier tracking down mutants with a device called Cerebro which amplifies his powers; the X-Men train within the Danger Room, first depicted as a room full of weapons and booby traps, now as generating holographic simulations; and the X-Men travel in their Blackbird jet. The X-Men train in the Danger Room, as depicted in X-Men Origins #1 (Oct. 2008). Art by Mike Mayhew. Asteroid M, an asteroid made by Magneto, a mutant utopia and training facility off of the Earth's surface. Avalon, Magneto's space station that served as the primary base for him and his Acolytes to create a mutants-only safe haven after Magneto drastically reverted to his villainous ways. Genosha, an island near Madagascar and a longtime apartheid regime against mutants. The U.N. gave control to Magneto until the E Is for Extinction story saw Genosha destroyed via mass genocide. Limbo, a hellish dimension heavily populated by demons. Whoever possesses the Soulsword bears control over and can draw power from Limbo. In Extraordinary X-Men the X-Men made Limbo their home after Terrigen started making earth uninhabitable for mutants. Madripoor, an island in South East Asia, near Singapore. Its location is shown to be in the southern portion of the Strait of Malacca, south west of Singapore. Murderworld, fictional twisted amusement park designed by the Marvel supervillain known as Arcade. Muir Island, a remote island off the coast of Scotland. This is primarily known in the X-Men universe as the home of Moira MacTaggert's laboratory. Mutant Town (also known as District X), an area in Alphabet City, Manhattan, populated largely by mutants and beset by poverty and crime. New Tien, a mutant-run region on the west coast of the United States where mutants outnumber humans. It was created after Hydra took over the United States. Emma Frost secretly leads New Tien by telepathically possessing New Tien's puppet ruler Xorn. Savage Land, a preserved location in Antarctica which is home to a number of extinct species, most notably dinosaurs, and strange tribes. Shi'ar throneworld Chandilar, the home world of the X-Men's occasional extraterrestrial allies The Shi'ar. Utopia, Cyclops had Asteroid M raised from the Pacific Ocean off the coast of the San Francisco as a response to the rise of anti-mutant sentiment to form a mutant nation. "Age of Apocalypse" – In a world where Professor X is killed before he can form the X-Men, Magneto leads the X-Men in a dystopian world ruled by Apocalypse. Created and reverted via time travel. "Days of Future Past" – Sentinels have either killed or placed into concentration camps almost all mutants. Prevented by the time-traveling Kate Pryde (the adult Kitty Pryde/Shadowcat). "House of M" – Reality is altered by Scarlet Witch, with her father Magneto as the world's ruler. 2005's crossover event, it concludes with a reversion to the normal Marvel Universe, albeit with most mutants depowered. Marvel 1602 – Mutants are known as the "Witchbreed" in this alternate reality set during the time of The Inquisition. Carlos Javier creates a "school for the children of gentlefolk" to serve as a safe haven and training ground. Marvel 2099 – Set in a dystopian world with new characters looking to the original X-Men as history, becoming X-Men 2099 and X-Nation 2099. Mutant X – Set in a world where Scott Summers was captured along with his parents by the Shi'ar and only Alex escaped, allowing him to be the eventual leader of this Universe's X-Men ("The Six"). The Mutant X universe reimagines Mr. Fantastic, Nick Fury, and Professor X as villains and Doctor Doom and Apocalypse as heroes. Time-displaced X-Men - The time-displaced team was introduced as such in All-New X-Men vol. 1 #1, by Brian Michael Bendis and Stuart Immonen, and brought to the present with time travel. They were kept as regular characters, as Bendis intended to explore their reactions to the fate of their adult selves. The team was the main focus of the Battle of the Atom crossover, some months later. Bendis also used them for crossovers with the Guardians of the Galaxy and Miles Morales, that he also wrote. This was one of the few crossovers between the Marvel Universe and the Ultimate Marvel universe; Bendis preferred to write them sparingly. All-New X-Men has a vol. 2 in 2015, by Dennis Hopeless and Mark Bagley. The comic was cancelled after the end of the Inhumans vs. X-Men crossover, and the team was now published in the X-Men Blue comic. The teenager Jean also got a solo series after the end of ResurrXion, by Hopeless and Victor Ibanez, that explored her relation with the Phoenix Force. The teenager Cyclops joins the Champions, a comic book focused on teenager heroes but unrelated to the X-Men mythos. They guest-starred in the Venom comic, in the "Poison-X" arc. The story took the villains from the Venomverse arc and led to the Venomized crossover. The team will be featured in the Extermination crossover. Ultimate X-Men – Set in the reimagined Ultimate Marvel universe. X-Men Forever – An alternate continuity diverging from X-Men, vol. 2 #3, continuing as though writer Chris Claremont had never left writing the series. X-Men Noir – Set in the 1930s, with the X-Men as a mysterious criminal gang and the Brotherhood as a secret society of corrupt cops. X-Men: The End – A possible ending to the X-Men's early 2005 status quo. X-Men '92 – Follows "Secret Wars", the X-Men of the 1992 TV Series, received their own comic book series. The conflict between mutants and normal humans is often compared to real-world conflicts experienced by minority groups in America such as African Americans, Jews, various religious (or "non-religious") groups such as Muslims and atheists, Communists, the LGBT community, the transgender community, etc. It has been remarked that attitudes towards mutants do not make sense in the context of the Marvel Universe, since non-mutants with similar powers are rarely regarded with fear; X-Men editor Ann Nocenti remarked that "I think that's literary, really - because there is no difference between Colossus and the Torch. If a guy comes into my office in flames, or a guy comes into my office and turns to steel, I'm going to have the same reaction. It doesn't really matter that I know their origins. ... as a book, The X-Men has always represented something different - their powers arrive at puberty, making them analogous to the changes you go through at adolescence - whether they're special, or out of control, or setting you apart - the misfit identity theme." Also on an individual level, a number of X-Men serve a metaphorical function as their powers illustrate points about the nature of the outsider. The X-Men are hated, feared and despised collectively by humanity for no other reason than that they are mutants. So what we have here, intended or not, is a book that is about racism, bigotry and prejudice. Racism: Although this was not initially the case, Professor X has come to be compared to civil rights leader Martin Luther King, Jr. and Magneto to the more militant Malcolm X. The X-Men's purpose is sometimes referred to as achieving "Xavier's dream," perhaps a reference to King's historic "I Have a Dream" speech. (Magneto, in the first film, quotes Malcolm X with the line "By any means necessary.") X-Men comic books have often portrayed mutants as victims of mob violence, evoking images of the lynching of African Americans in the age before the civil rights movement. Sentinels and anti-mutant hate groups such as Friends of Humanity, Humanity's Last Stand, the Church of Humanity, and Stryker's Purifiers are thought to often represent oppressive forces like the Ku Klux Klan giving a form to denial of civil rights and amendments. In the 1980s, the comic featured a plot involving the fictional island nation of Genosha, where mutants are segregated and enslaved by an apartheid state. This is widely interpreted as a reference to the situation in South Africa at the time. Anti-Semitism: Explicitly referenced in recent decades is the comparison between antimutant sentiment and anti-Semitism. Magneto, a Holocaust survivor, sees the situation of mutants as similar to those of Jews in Nazi Germany. At one point he even utters the words "never again" in a 1992 episode of the X-Men animated series. The mutant slave labor camps on the island of Genosha, in which numbers were burned into mutant's foreheads, show much in common with Nazi concentration camps, as do the internment camps of the classic "Days of Future Past" storyline. In the third X-Men film, when asked by Callisto: "If you're so proud of being a mutant, then where's your mark?" Magneto shows his concentration camp tattoo, while mentioning that he will never let another needle touch his skin. In the prequel film X-Men: First Class, a fourteen-year-old Magneto suffers Nazi human experimentation during his time in the camps and witnesses his mother's death by gunshot. Diversity: Characters within the X-Men mythos hail from a wide variety of nationalities. These characters also reflect religious, ethnic or sexual minorities. Examples include Kitty Pryde, Sabra and Magneto who are of Jewish descent. Dust and M who are Muslim, Nightcrawler who is a devout Catholic. Neal Shaara/Thunderbird who is Hindu. Jubilee is Chinese American, Gambit is born to Cajun parents from New Orleans, Louisiana and Rogue is from Caledecott County, Mississippi. Warpath along with his deceased brother the first Thunderbird are Native Americans of Apache descent. Storm represents two aspects of the African diaspora as her father was African American and her mother was Kenyan. Karma was portrayed as a devout Catholic from Vietnam, who regularly attended Mass and confession when she was introduced as a founding member of the New Mutants. This team also included Wolfsbane (a devout Scottish Presbyterian), Danielle Moonstar (a Native Americans of Cheyenne descent), Cannonball, and was later joined by Magma (a devout Greco-Roman classical religionist). 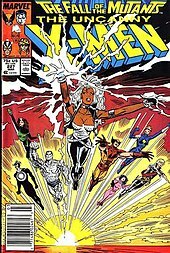 Different nationalities included Wolverine, Aurora, Northstar, Deadpool and Transonic from Canada; Colossus and Magik from Russia; Banshee and Siryn from Ireland; Dust from Afghanistan; Psylocke, Wolfsbane and Chamber from the United Kingdom; Sunfire, Armor, Surge and Zero from Japan; Sunspot from Brazil; M from Monaco; Nightcrawler from Germany; Sabra from Israel; Omega Sentinel, Neal Shaara, Kavita Rao and Indra from India; Velocidad from Mexico; Oya from Nigeria; Primal from Ukraine; etc. LGBT themes: Some commentators have noted the similarities between the struggles of mutants and the LGBT community, noting the onset of special powers around puberty and the parallels between being closeted and the mutants' concealment of their powers. In the comics series, gay and bisexual characters include Anole, Bling!, Destiny, Karma, Mystique, Psylocke, Courier, Northstar (whose marriage was depicted in the comics in 2012), Graymalkin, Rictor, Shatterstar, the Ultimate version of Colossus and later Iceman. In the film X2, Iceman's mother asks him, "Have you ever tried not being a mutant?" after revealing that he is a mutant; the comics version of the character was then revealed to be gay in 2015. Transgender issues also come up with shapechangers like Mystique, Copycat, and Courier who can change gender at will. It has been said that the comic books and the X-Men animated series delved into the AIDS epidemic with a long-running plot line about the Legacy Virus, a seemingly incurable disease thought at first to attack only mutants (similar to the AIDS virus which at first was spread through the gay community). In the film X-Men: First Class, Hank McCoy is asked by his CIA boss why he never disclosed his mutant identity, and his response was "you didn't ask, I didn't tell". Red Scare: Occasionally, undercurrents of the "Red Scare" are present. Senator Robert Kelly's proposal of a Mutant Registration Act is similar to the efforts of United States Congress to try to ban communism in the United States. In the 2000 X-Men film, Kelly exclaims, "We must know who these mutants are and what they can do," even brandishing a "list" of known mutants (a reference to Senator Joseph McCarthy's list of Communist Party USA members who were working in the government). Religion: Religion is an integral part of several X-Men storylines. It is presented as both a positive and negative force, sometimes in the same story. The comics explore religious fundamentalism through the person of William Stryker and his Purifiers, an antimutant group that emerged in the 1982 graphic novel God Loves, Man Kills. The Purifiers believe that mutants are not human beings but children of the devil, and have attempted to exterminate them several times, most recently in the "Childhood's End" storyline. By contrast, religion is also central to the lives of several X-Men, such as Nightcrawler, a devout Catholic, and Dust, a devout Sunni Muslim who wears an Islamic niqāb. Subculture: In some cases, the mutants of the X-Men universe sought to create a subculture of the typical mutant society portrayed. The Morlocks, though mutants like those attending Xavier's school, hide away from society within the tunnels of New York. These Morlock tunnels serve as the backdrop for several X-Men stories, most notably The Mutant Massacre crossover. This band of mutants illustrates another dimension to the comic, that of a group that further needs to isolate itself because society won't accept it. In Grant Morrison's stories of the early 2000s, mutants are portrayed as a distinct subculture with "mutant bands," mutant use of code-names as their primary form of self-identity (rather than their given birth names), and a popular mutant fashion designer who created outfits tailored to mutant physiology. The series District X takes place in an area of New York City called "Mutant Town." These instances can also serve as analogies for the way that minority groups establish subcultures and neighborhoods of their own that distinguish them from the broader general culture. Director Bryan Singer has remarked that the X-Men franchise has served as a metaphor for acceptance of all people for their special and unique gifts. The mutant condition that is often kept secret from the world can be analogous to feelings of difference and fear usually developed in everyone during adolescence. Genocide: Genocide and its psychological after-effects, primarily survivor guilt, are recurring elements in some of the most significant X-Men story arcs. Magneto was a survivor of The Holocaust and witnessed the genocide of his people, severely scarring him emotionally and leaving him with a strong distrust of humanity. Because of this he constantly toes the line between ally and enemy of the X-Men. The iconic Days of Future Past story line saw an alternate future where Sentinels committed genocide on most of the world's mutants. In Rachel Summers' original timeline, she was captured by humans and turned into a 'hound' used to hunt down other mutants in order to capture and kill them, leaving her extremely traumatized by the experience and knowledge that she unwittingly assisted in the genocide of her own people. Bishop's childhood consisted of him being trapped in a mutant concentration camp, leaving him so emotionally scarred as an adult that upon returning to the past he was prepared to kill a baby who might have caused his future. When Cassandra Nova committed genocide on Genosha, the event left both Emma Frost and Polaris traumatized by survivors guilt as they were amongst the limited few survivors. While taking some time off in Germany, Nightcrawler witnessed the genocide of numerous mutants.The event left him as an emotional shell of who he used to be because of the trauma of what he witnessed until he had psychic therapy with Jean to help him cope. Other characters who have either committed or have survived genocide include Mystique, Callisto, Apocalypse, Onslaught, Bastion, Mister Sinister, Hope Summers, Cable, and the Phoenix Force. The insecurity and anxieties in Marvel's early 1960s comic books such as The Fantastic Four, The Amazing Spider-Man, The Incredible Hulk, and X-Men ushered in a new type of superhero, very different from the certain and all-powerful superheroes before them, and changed the public's perception of superheroes. The X-Men team has featured in multiple forms of media including a live-action film series, multiple animated shows, live-action shows, multiple video games, numerous novels, motion comics, soundtracks, action figures and clothing. ^ "Stan Lee". Archive of American Television. March 22, 2004. Retrieved January 4, 2015. ^ Conversations With The Comic Book Creators," Leonard Pitts, 1987, published on the :Kirby Effect: The Journal of the Kirby Museum," 6 August 2012. ^ Lee, Stan; Jack Kirby (August 2005). Son of Origins of Marvel Comics. 1. John Buscema, Don Heck, Bill Everett, Gene Colan. Marvel Comics. p. 448. ISBN 0-671-22166-3. ^ "The X-Men Files". NYMag.com. ^ Nickerson, Al (August 2008). "Claremont and Byrne: The Team that Made the X-Men Uncanny". Back Issue!. Raleigh, North Carolina: TwoMorrows Publishing (29): 3–12. ^ Brown, Scott (May 9, 2003). "The NeXt Level". Entertainment Weekly. Retrieved April 11, 2009. ^ O'Neill, Patrick Daniel (August 1993). "Hitting the Right Chord". Wizard: X-Men Turn Thirty. pp. 84–85. ^ Grant, Paul J. (August 1993). "Poor Dead Doug, and Other Mutant Memories". Wizard: X-Men Turn Thirty. pp. 66–69. ^ a b O'Neill, Patrick Daniel (August 1993). "The Future is Now". Wizard: X-Men Turn Thirty. pp. 12–25. ^ "My Monthly Curse by Phill Hall No. 9 – Taking Apart a Guinness World Record". Bleeding Cool. May 9, 2011. ^ Morse, Ben (August 10, 2010). "SDCC 2010: Marvel Breaks World Record" Archived August 18, 2010, at the Wayback Machine, Marvel.com. ^ Cantor, Michael (Producer); Schreiber, Liev (Narrator) Superheroes: A Never-Ending Battle. PBS. October 15, 2013. ^ O'Neill, Patrick Daniel (October 1991). "X Marks the Spot: Chris Claremont and Marvel's Mutants". Wizard (2). Retrieved April 20, 2009. ^ "State of the Art: The X-Men Post-Messiah CompleX". The Independent Comics Site. Archived from the original on January 3, 2008. Retrieved January 27, 2008. ^ "X-Writers Prepare for the "Second Coming"". Comic Book Resources. October 12, 2009. Retrieved August 14, 2010. ^ "Second Coming: Prepare #1". Comic Vine. February 24, 2010. Retrieved August 14, 2010. ^ Wheeler, Andrew (July 1, 2015). "All New, All Different Marvel: Your Guide to the X-Books". Archived from the original on May 23, 2016. Retrieved May 9, 2016. ^ "Better Luck X-Time: The 15 Best X-Men Time Travel Tales". February 12, 2017. ^ "Latest X-Men Comic Villain Is The Heritage Think Tank". May 11, 2017. ^ Truitt, Brian (September 8, 2013). "Sunday Geekersation: Bendis takes pride in his X-Men". USA Today. ^ Dave Richards (August 15, 2014). "Bendis' "All-New X-Men" Take an Ultimate Journey with Miles Morales". CBR. Retrieved November 6, 2017. ^ Kiel Phegley (June 20, 2013). "Bendis & Fialkov Grow Ultimate "Hunger"". CBR. Retrieved November 6, 2017. ^ Steve Morris (February 18, 2016). "DENNIS HOPELESS REUNITES THE 'ALL-NEW X-MEN'; HOPE THEY SURVIVE THE EXPERIENCE?". Comics Alliance. Retrieved July 3, 2018. ^ Brett White (January 12, 2016). "Marvel Reveals Jean Grey Creative Team, Phoenix-Related Premise". CBR. Retrieved July 3, 2018. ^ Thomas Bacon (March 30, 2018). "Cyclops is Officially Too Good For Marvel's X-MEN". Screen Rant. Retrieved July 3, 2018. ^ Dave Richards (February 28, 2018). "Cullen Bunn's X-Men Blue Cry Havok & Let Slip the Symbiotes of War". CBR. Retrieved July 3, 2018. ^ Graeme McMillan (April 3, 2018). "Marvel Teases 'Extermination' for X-Men Comics". Hollywood Reporter. Retrieved July 3, 2018. ^ "NYCC '09: Claremont and the X-Men: With a Twist". Newsarama. February 6, 2009. Retrieved August 14, 2010. ^ Polo, Susana (March 13, 2015). "Marvel's X-Men: '92 #1 will bring the '90s cartoon X-Men to modern comics". Polygon. ^ Hall, Kelley J.; Lucal, Betsy (January 1999). "Tapping into parallel universes: using superhero comic books in sociology courses". Teaching Sociology. 27 (1): 60–66. doi:10.2307/1319247. JSTOR 1319247. ^ Shuckburgh, Emily (2008). Survival: the survival of the human race. Cambridge University Press. p. 69. ISBN 978-0-521-71020-6. Retrieved July 14, 2011. ^ O'Neill, Patrick Daniel (October 1986). "Ann Nocenti". Comics Interview (39). Fictioneer Books. pp. 58–59. ^ Darius, Julan (September 25, 2002). "X-Men is Not an Allegory of Racial Tolerance". Sequart Research & Literacy Organization. Retrieved August 1, 2011. ^ a b Baron, Lawrence (2003). "X-Men as J Men: The Jewish Subtext of a Comic Book Movie". Shofar: An Interdisciplinary Journal of Jewish Studies. University of Nebraska Press. 22 (1): 44–52. doi:10.1353/sho.2003.0075. Retrieved July 14, 2011. ^ Sen, Raja (May 26, 2006). "Mutants aren't what they used to be". Rediff.com. Retrieved July 14, 2011. ^ Godwin, Garrett (January 14, 2009). "Dr. King's 80th Birthday". NewsBlaze. Retrieved July 14, 2011. ^ Dalton, Russell (2011). Marvelous Myths: Marvel Superheroes and Everyday Faith. Chalice Press. p. 89. ISBN 978-0-8272-2338-7. Retrieved July 14, 2011. ^ a b Lyubansky, Mikhail (2008). "Prejudice lessons from the Xavier Institute". The Psychology of Superheroes: An Unauthorized Exploration. Benbella Books. pp. 75–90. ISBN 978-1-933771-31-1. Retrieved July 14, 2011. ^ a b Booker, M. Keith (2010). Encyclopedia of Comic Books and Graphic Novels. ABC-CLIO. p. 430. ISBN 978-0-313-35746-6. Retrieved July 14, 2011. ^ a b Housel, Rebecca; Wisnewski, Jeremy (2009). X-Men and philosophy: astonishing insight and uncanny argument in the mutant ... John Wiley and Sons. ISBN 978-0-470-41340-1. Retrieved July 14, 2011. ^ Weiner, Robert G. (2008). Marvel graphic novels and related publications: an annotated guide to comics, prose novels, children's books, articles, criticism and reference works, 1965–2005. McFarland. p. 309. ISBN 978-0-7864-2500-6. Retrieved July 14, 2011. ^ a b Raafat, Ahmed; Nasser, Ali (May 2006). "Spotlight X-Men". TeenStuff (99). Retrieved July 14, 2011. ^ Powell, John (July 14, 2000). "The X-Men slay Batman". Jam!. Archived from the original on July 14, 2012. Retrieved July 14, 2011. ^ a b Beckerman, Jim (July 5, 2006). "Comic-book characters defy stereotypes: Writers stretch appeal through diverse heroes". Chron. Retrieved July 14, 2011. ^ Trushell, John M. (August 2004). "American Dreams of Mutants: The X-Men—"Pulp" Fiction, Science Fiction, and Superheroes". The Journal of Popular Culture. John Wiley & Sons. 38 (1): 149–168. doi:10.1111/j.0022-3840.2004.00104.x. ^ Hartl, John (May 25, 2006). "The X-Men Come Out". MSNBC. Retrieved June 2, 2007. ^ Wenz, John (June 5, 2006). "Lesbian Batwoman in danger of becoming stereotype". Daily Nebraskan. Archived from the original on September 27, 2011. Retrieved July 14, 2011. ^ "X-Men 3: The Last Stand (2006) Movie Review – 3.0 out of 4.0 stars". The Movie Insider. Retrieved August 14, 2010. ^ Zimmerman, David A. (2004). Comic book character: unleashing the hero in us all. InterVarsity Press. p. 78. ISBN 978-0-8308-3260-6. Retrieved July 14, 2011. ^ Weiner, Robert G. (2008). Marvel graphic novels and related publications: an annotated guide to comics, prose novels, children's books, articles, criticism and reference works, 1965–2005. McFarland. p. 111. ISBN 978-0-7864-2500-6. Retrieved July 14, 2011. ^ Fingeroth, Danny (2006). "Review of Superman on the Couch: What Superheroes Really Tell Us About Ourselves and Our Society". ImageText. University of Florida. ISSN 1549-6732. Fecteau, Lydia (July 12, 2004). "Mutant and Cyborg Images of the Disabled Body in the Landscape of Science Fiction". Archived from the original (DOC) on September 30, 2005. Retrieved September 29, 2005. Morrison, Grant (August 10, 2000). "The Geek Shall Inherit the Earth". The Evening Standard. Archived from the original on February 19, 2006. Retrieved September 29, 2005. Weinstein, Simcha (2006). Up, Up, and Oy Vey: How Jewish History, Culture and Values Shaped the Comic Book Superhero. Baltimore: Leviathan. Note: Contains a chapter on the X-Men, with special emphasis on Jewish characters Magneto and Shadowcat. Montgomery, Mitch (October 21, 2006). "X-traordinary People: Mary Tyler Moore and the Mutants Explore Pop Psychology". Silver Bullet Comics. Archived from the original on October 26, 2006.